Immediate action after a weather event will limit damages and minimize consequential damage caused by exposure to the elements. If your roof was damaged by hail, wind, or a tornado, call Apex Roofing. We will provide you with an immediate response and can help you navigate the process of working with your insurance company. Every member of our Weather Damage Response Team is highly trained, knowledgeable, and equipped to get you back into your home or business…fast. One phone call gets DFW Best Roofing started and working for you. . . Put your trust in a DFW Best Roofing…a local leader in storm related roofing repair! We stand behind quality products and services and we have extensive experience working with all types of residential/commercial exterior configurations and materials manufacturers. Do I Have Hail Damage? What Does It Look Like? If you have been in a Texas hailstorm, you need someone to evaluate the damage to your roof. Most people do not ever consider that their home was damaged. Your roof is as susceptible to hail damage as the hood of your car. When hail hits your roof it creates a bruise. This bruise may have even cracked the fiberglass membrane and can allow water to seep into your home. It may not leak the day after the storm but over time it will happen. It’s difficult to determine whether a shingled roof needs to be replaced after a hail storm because the damage is not readily evident. Our hail damage specialists are specially trained and experienced to determine the damage and make corrective action We check the entire roof structure and gutter system. If we see a large amount of granules re-roofing would be a consideration. Granules aren’t just for appearance purposes, they’re there to protect the asphalt based roof product (the shingle). It doesn’t take much of a hail storm to dislodge a bunch of granules, thereby exposing the asphalt and shortening the service life of your roof. Many times hail storms produce visible damage, but beware, only a trained roofing hail damage specialist can uncover the real damage! Did you know you may only have a limited time to make a claim on your roof ? Some insurance companies only allow claims for up to one year. And it costs you nothing to check it out. Just call us or email today for your free, no obligation inspection. If there is an issue, let us help guide you through the insurance process for the replacement of your home’s roof. 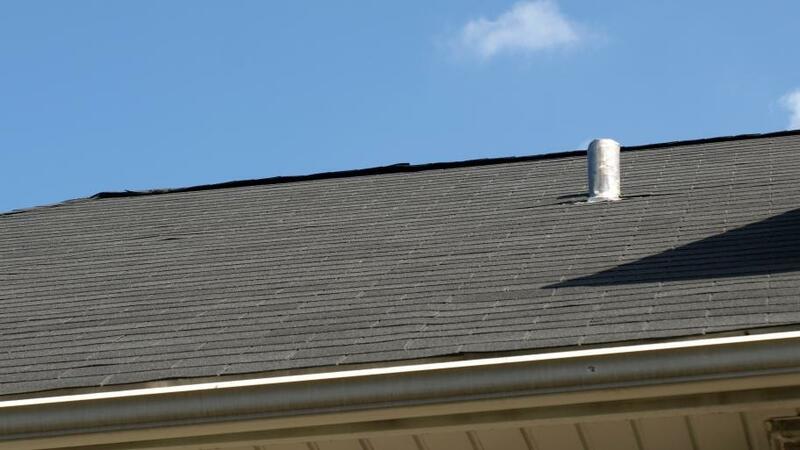 If you have had hail in your area, we can only determine if the shingles have been damaged by close inspection of the shingles—this inspection must be made from the rooftop and must be done by a professional trained in hail damage assessment. If you have wind damage, you may see shingles on the ground or shingles missing from your roof but not all damage is visible from the ground. Our inspectors have two levels of hail and wind certifications: HAAG Certification, the foremost authority in the roofing failure and damage assessment industry and Estimatix Hail and Wind Certification, a comprehensive property insurance adjusters training program. My roof looks fine! Could it still be damaged? Roofing systems must be physically inspected by a structural damage inspector to determine if there is actual hail or wind damage. Hail and wind damage is subtle in nature and may not physically cause leakage for years after the storm. 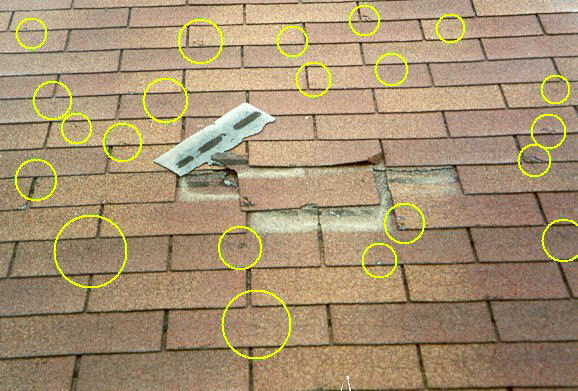 Some would say that granular loss does not necessarily constitute damage to the asphalt shingles themselves. Some would say that the shingles are designed to lose granules, which is partly true. 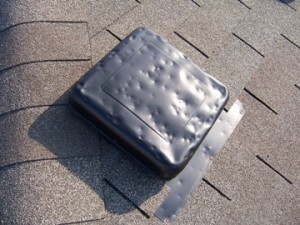 However, shingles that suffer accelerated granular loss due to hail and wind storms are decreasing in product life and performance. Granular loss that exposes the asphalt mat of a shingle constitutes damage. My gutters and siding were damaged in the storm. Can you help with this as well? Yes, of course. We are a full service repair company. 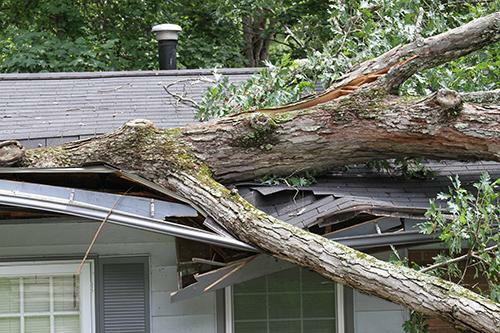 We can cover any issues you have that are storm related including damage done to the interior of your home. Why would my insurance company replace my roof/siding/gutters? The purpose of homeowner's insurance is to protect homeowners against losses in their property's value due to damage that is beyond their control (Acts of God). If you have hail or wind damage, you have experienced a financial loss, in that your original investment of a 25-year roof (for example) has now been reduced to a 5-10 year useful life span. Your insurance company will compensate you for your loss and replace your roof. The subtle nature of hail and wind damage is that it may pose no immediate threat to the structural integrity of the roof. However, many insurance companies have a "statute of limitations" of how long a hail or wind claim is viable. If you have experienced a loss such as hail or wind damage it is wise to take care of the problem in a timely manner before it leads to other associated problems. You should deal with it now rather than later when it will cost you much more money. My insurance company denied my claim, so am I out of luck? No. We have overturned many denied claims and can assist you through the process. 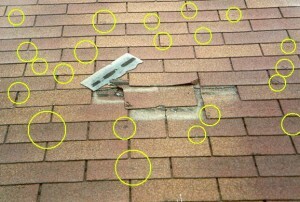 When an Insurance Adjuster inspects my roof, how do I know if he understands roofs enough to spot hidden damage? The best results for the benefit of homeowner are obtained when an experienced roofer walks through the inspection with the insurance adjuster and calls to the adjuster's attention any damage that he sees. Many adjusters are not properly hail and wind certified. Will my insurance company cancel my policy if I file an insurance claim? If your roof has any damage whatsoever, you have a VALID insurance claim and should file with your insurance company. Insurance companies cannot cancel your policy for a disaster-related claim. If I do not file my claim, will my insurance company raise my rates? After a disaster, insurance companies may raise everyone's rates. By not filing your claim your personal rate increase is paying for everyone else's damage except yours.